Truman Streckfus Persons, known as Truman Capote, was an American author, many of whose short stories, novels, plays, and nonfiction are recognized literary classics, including the novella Breakfast at Tiffany's (1958) and the true crime novel In Cold Blood (1966), which he labeled a "nonfiction novel." At least 20 films and television dramas have been produced from Capote novels, stories and screenplays. Capote rose above a childhood troubled by divorce, a long absence from his mother and multiple migrations. He discovered his calling by the age of 11, and for the rest of his childhood he honed his writing ability. 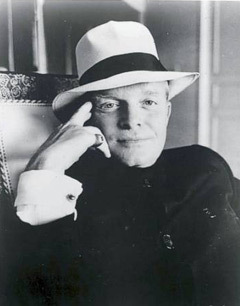 Capote began his professional career writing short stories. The critical success of one story, "Miriam" (1945), attracted the attention of Random House publisher Bennett Cerf, resulting in a contract to write Other Voices, Other Rooms (1948). Capote earned the most fame with In Cold Blood, a journalistic work about the murder of a Kansas farm family in their home, a book Capote spent four years writing, with much help from Harper Lee, who wrote the famous To Kill a Mockingbird. A milestone in popular culture, it was the peak of his career, although it was not his final book. In the 1970s, he maintained his celebrity status by appearing on television talk shows. In California you lose a point off your IQ every year.